django-Mobileadmin is the Django admin interface for mobile devices. django-Mobileadmin is an alternative admin interface for Django 1.0 for use with mobile devices such as the iPhone/iPod touch or Blackberry. Some would call Mobileadmin a theme or a skin, but actually it's more than that. django-Mobileadmin resembles almost all features of the regular Django admin interface and brings everything you need to add support for arbitrary devices. Hope over to the documentation for installation and customization instructions. We hope you like django-Mobileadmin. 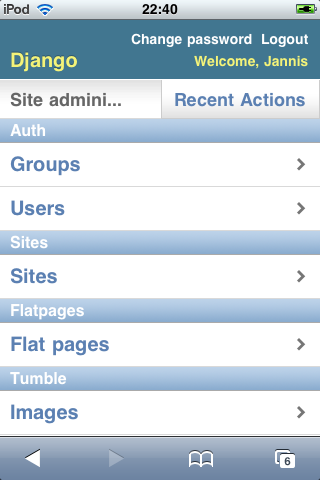 One of the possible admin templates optimized for MobileSafari (iPhone/iPod touch) is bundled with django-Mobileadmin. Qweas is providing links to MobileAdmin 0.5.2 as a courtesy, and makes no representations regarding MobileAdmin or any other applications or any information related thereto. Any questions, complaints or claims regarding this application MobileAdmin 0.5.2 must be directed to the appropriate software vendor. You may click the publisher link of MobileAdmin on the top of this page to get more details about the vendor.